The CTO | Random (but helpful!) thoughts on various subjects in IT such as Project Management, Application Development, Quality Assurance and keeping sane while keeping up with it all. We are all excited to jump in and start in using a new set of tools, but first we probably should make sure the installation went ok first and it's fairly simple. Next we will dive into a few steps that will help us with this. I'll give a couple of tips for upgraders at since that’s fairly specific to your environment. This one is easy and determines a whole host of services and web sites have been configured correctly. Let's start by looking at the main URLs for the Team Foundation Server (you can get the first one from the "Success" window from your install if that is still up, or if you closed it just following the steps below). 1. Get the URL. Go to the Start Menu ➤ Team Foundation Server 2013 ➤ Team Foundation Server Administration Console. 3. Now that we have that we can check the Web Access services with the URL. (Note the Server URL would also be able to perform this quick test on the local server). Put that URL into a browser window on the TFS server. You should see windows displayed similar to the ones below in Figure 3-2. Click on the Administer panel and this window should pop up as in Figure 3-3. We'll visit this window again later. The above system level services are to be expected on a Standard Single Server install like we performed elsewhere in this book. If you have another configuration or a scaled out deployment your individual servers would not necessarily run all of these. These are fairly easy to identify in the Service applet and should be running and should be set to Automatic start. There are a bunch of others that will be seen in a fully configured TFS server as other featured are added (as in the Build Service we'll check out next) but these are good to start with. An interesting service worth mentioning is the last one on the list. You'll only know something is wrong with the "Visual Studio Team Foundation Background Job Agent" when things you did in the system don’t seem like they took properly (permissions for instance) so it bears both initial checking and monitoring on occasion since it can be confusing when you are setting things up properly and it doesn’t seem to be working through no fault of yours. 1. Start the Services applet. Go to Start ➤ Administrative Tools ➤ Services. 2. Verify key services are running and Set to Automatic Start as in Figure 3-4. As mentioned in the previous chapter, there are scaling considerations to consider. This is especially true if you are in an existing environment that is maxed out and this update is part of your plan to add capacity. Most people however, they are looking at single server environments or close to that. A new installation is the most straight forward installation type. We have no earlier versions of Team Foundation Server to contend with and other than the normal prerequisites, we can begin the installation. Here we are going to assume you are using a single server configuration and haven’t chosen scale the environment to multiple servers (see Chapter 1 for more details on scaling and performance). · Basic - this will install (as the name implies) just the basic services for running TFS. It will also either install SQL Express, or let you connect to existing SQL Server Standard or Enterprise but won't install them for you. You'll get Source Control, Work Item Tracking, and Build Services. You will not however get SharePoint or Reporting Services Integration configured. All default options will be selected for you. · Standard Single Server - This wizard also is also intended for a single server with the default options. The big difference with this one is that it will also install SharePoint Foundation 2013 (or configure it), and configure SQL Server Reporting Services. This is the one recommended for most single server installs of TFS, and the one we'll walk through in this book. The big caveat with this one is that you need to use the default instance of SQL Server (which is ok most of the time, unless you are using SQL for something else that commandeered it on you). You also can't use this wizard if you want to use remote SQL, Reporting, or SharePoint servers. Additionally if you want to use Negotiate (Kerberos) authentication, or if you need to install the Application Tier onto and existing web site set it up to use a different port, you'll want to use the Advanced wizard instead. · Advanced - If you need full control over all aspects of the install, this is the one for you. It only runs on Windows Server OS's (so no client OS installs with this one). It can do everything the Standard one can do plus support using remote SharePoint, SQL, or SQL Reporting Servers. You can also install the Application Tier on a different port, us a non-default instance of SQL Server or Reporting Services, or if you want to skip SharePoint or SQL Reporting Services integration. Additionally you can use Negotiate (Kerberos) authentication with this wizard. The only thing you wouldn’t want to use this for is just installing or reinstalling the Application Tier on its own (look below for that). · Application Tier Only - As the name implies, it is used mainly to install an additional Application Tier (Team Foundation Server) to your existing Team Foundation deployment. You can use it on Client and Server OS's. It's also very useful for moving a TFS from one server to another and for disaster recovery. 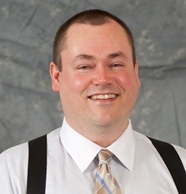 Don’t use this wizard to set up your first Team Foundation Server. · Upgrade - This is the wizard to use to upgrade from an older Team Foundation Server version. It supports both client and server OS's. Please remember to back up your server prior to starting this wizard. This wizard has come a long way from when they introduced it in TFS 2010 but it still never fails to inspire panic since one of the first things it does is remove the old version and if it fails it will not reinstall the old one for you. Here we will want to install using the Standard Configuration. This makes sense if you want to install Team Foundation Server on a single server with reporting and a team portal. It makes installation much simpler. The workflow we are going to follow here is very simple and I’ll detail it here in Figures 2-1, 2-2 for your reference. Windows 2000 mixed mode Domain controllers that are running Windows NT Server 4.0, Windows 2000, Windows Server 2003, and Windows Server 2003 R2. Windows Server 2003 interim mode Domain controllers that are running Windows NT Server 4.0, Windows Server 2003, and Windows Server 2003 R2. You will likely need to open some ports on your firewall so Team Foundation Server can communicate with the various interfaces it needs. My table below shows the default ports you will need to make sure are open. If you have modified your installation you’ll need to verify what these are set to in your environment. This may require you speaking with your IT department if you are in a larger company. Also, if you are using Windows Firewall the install process will set the ports for you. If you are using another firewall you’ll need to check the documentation or with your local IT person to figure out how to get these open. · Shared Service Host, ports assigned through DCOM. 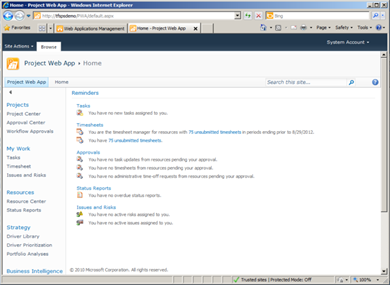 SharePoint Central Administration (If you aren’t sure just start the app and check. If you need to change it you will need to do it in both the here and in the Bindings for the site in IIS). For the love sanity, if you choose to go the SBS route, make sure you calculated your fully configured SBS server with all its components (Exchange, etc.) the ADD the Team Foundation Server requirements in addition to those. Better yet would be to use it in your deployment, but not as a single server TFS solution. For installations of TFS or SQL Server with Windows Server 2008 R2, you need .NET Framework 3.5 installed. On Windows Server 2008 R2, you can install .NET Framework 3.5 by using the Add Features Wizard from Server Manager. Best to use a client OS only as a test install for a proof of concept. You will not be able to install SharePoint, Reporting, TFSProxy. What does this mean for you? No website to collaborate, no HTML project reports, and you won’t be able to proxy source files. Move to a server OS above for any production use. I always find it amazing when I see questions on “performance issues”, then find someone using a client operating system. Also, the “Standard” install isn’t supported on a client OS since it installs SharePoint. Have I talked you out of trying to do this on the cheap with a client OS yet? Very good. Nothing gets more hotly contested in systems engineering circles than performance recommendations. The recommendations in the table below come directly from Microsoft. They are the minimum. Take special note of the new hard disk requirements. Also, the numbers below do not include recommendations for SharePoint installed on the same server, those recommendations are in the next section. My notes from my personal experience are in a note below. The following table reviews the general hardware recommendations for Team Foundation Sever, broken out by tier or role. These are good starting recommendations but you need to keep in mind any local considerations that may increase these. Single-server (Team Foundation Server and the Database Engine on the same server). 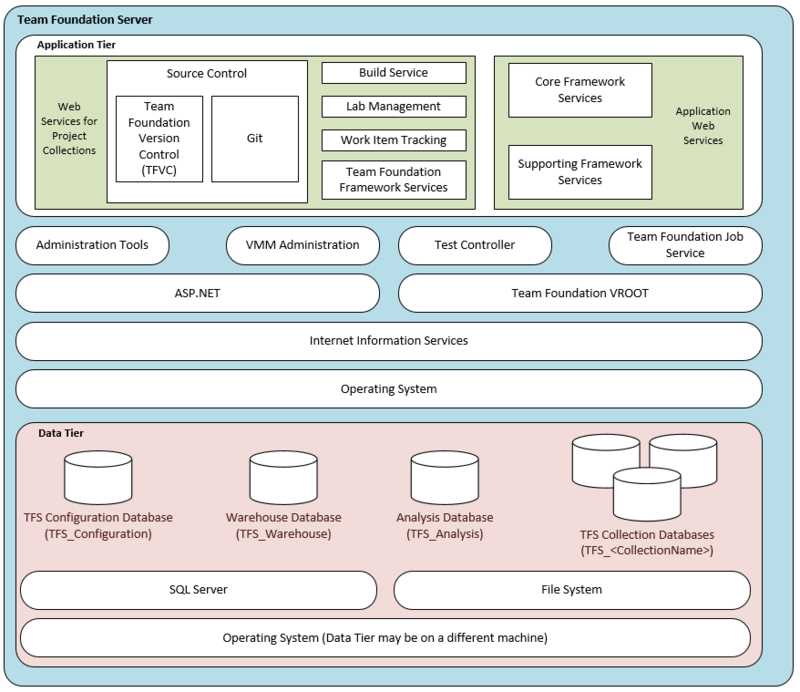 Dual-server (Team Foundation Server and the Database Engine on different servers). So you need more performance out of your Team Foundation Server 2013 installation. First step would be sure you meet the minimum requirements in this chapter. Since there are a lot of scenarios here, let’s consider this one: you’re starting to max out on your singe server installation. The one axiom you will note in any system performance recommendation chart is that you can never have enough RAM, fast enough processors, or fast enough disk subsystems to support everything on one system. So what in general should you scale out to? It really depends on what components in the Team Foundation Server are the heaviest used. For a lot of people, that ends up being the SharePoint Sever. After that move your databases to a separate SQL Server and Reporting Services server. Now I covered a very select scenario here, and yours may be different. 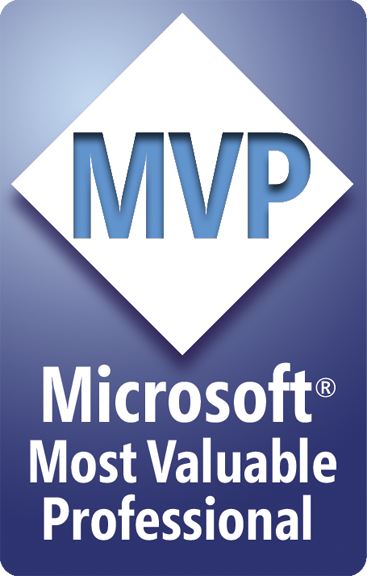 For more advanced considerations I’d highly recommend reading up on Team Foundation Server performance recommendations in the Visual Studio ALM Rangers guide here http://vsarplanningguide.codeplex.com/ . Hey folks just a heads up to keep an eye out for excepts from my upcoming book here. Publication date sometime around early summer 2015. In this chapter we'll examine the various permissions, services accounts needed, and various roles involved in this integration. We'll also cover the steps you'll need to perform to set each of these. Please keep in mind that depending on your unique environment, and re-use of existing accounts and groups, some of these permissions may have already been granted. Team Foundation Server: In order to perform any of the operations in this chapter you will need to belong to the Team Foundation Administrators group (alternately you could also assign the view instance-level information and edit instance-level information to Allow). You'll also need to have access to the Team Foundation Server Administration Console page (alternately, you could also use the Group Membership dialog box in Team Explorer, but the Team Foundation Administration Console page is much easier to work with for this). Project Server: In Project Server, you'll need the Manage users and groups global permission for an instance of Project Web Access or PWA. To set these, you'll need access to the Project Server through PWA. SQL Server: To grant Project Server 2010 permissions for the reporting database, you need to be a member of the administrators' security group for the SQL Server databases for Project Server. SharePoint: In SharePoint, you must belong to the Farm Administrators group, the administrators group for the web application that supports Project Server, or the SharePoint Administration group. The exact group membership you will use will depend on the specifics of your deployment. Grant Full Control permissions to start the Project Server Service Application. For the PWA Publish database, grant the Select permission. Full Control permissions to the Project Server Service Application. Add these users to the Team Foundation Administrators group. Add these users to the Administrators group for each instance of PWA that you will register with TFS. Grant the Administer Project Server integration permission to these users. Add accounts of team members to the contributor group for the team project. Add team members to the Team Members group for PWA, or grant them the Open Project and View Project Site permissions in project. You must also add these accounts to the enterprise project pool and to the resource pool for the project plan. Accounts of users of Project Professional. Grant view project-level information or assign them as members of the project Reader group. Add these accounts to the Project Manager group on Project Server. 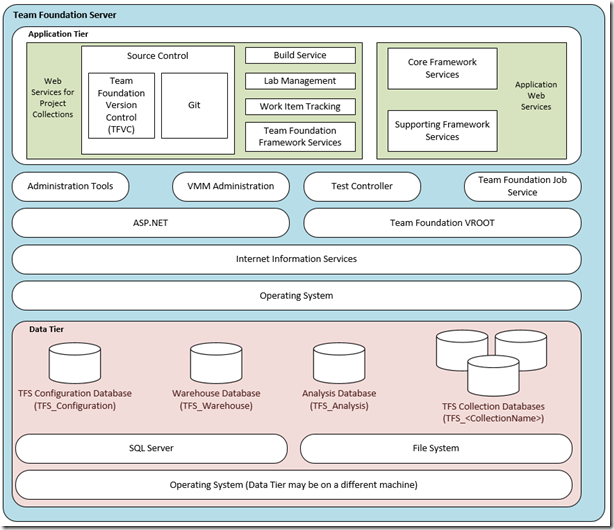 Launch the Team Foundation Server Administration Console page. Expand the server node (Application Tier), click on Team Project Collections, click on a collection, and then click on the Administer Security option. In the Global Security window, click on [Collection]\Project Collection Service Accounts. Under Permissions for the Administer Project Server integration, select the Allow checkbox. Click on the Close option to close the Global Security window. Either add the service account for Team Foundation Server to the administrators group, or grant that account the minimum set of Global and Category permissions as described in the previous reference table. From the PWA home page, in the Quick Launch area (from the side menu, on the left-hand side, scroll all the way down), select Server Settings. From the Server Settings page, select Manage Users. From the Manage Users page, select New User. This will begin the creation of a new user account. You will return here as needed by add additional administrators. Uncheck the checkbox for User can be assigned as a resource if the account is a service account. This would be left as default for normal users, but not for an administrator. In the User Authentication field, enter the account name of the user or service account you want to use. Uncheck the checkbox for Resource can be leveled if the account is an administrator or a service account. This would be left as default for normal users, but not for an administrator as noted previously. Lastly, you'll need to add the account to the Administrators group, from Security Groups, select Administrators in the list and then click on Add. From the PWA page, in the Quick Launch area, click on the Server Settings option. From the Server Settings page, click on Manage Users. From the Manage Users page, click on New User. Clear the checkbox for User can be assigned as a resource because the account is a service account. For user authentication, type the account name of the service account. To assign Global Permissions, select the Allow checkbox for each permission that you want to set, and as specified earlier in this topic. From the home page for PWA, in the Quick Launch area, click on the Server Settings option. From the Server Settings page, click on the Manage Categories option. From the Manage Categories page, click on the New Category option. From the Add or Edit Category page, type a name for the service account category. For example, type Servicing Account. Under the Available Users list, click on the name of the service account for Team Foundation Server, and then click on Add. 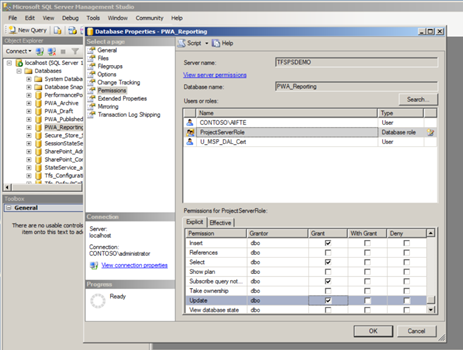 Under the Projects list, click on the All current and future projects in Project Server database option. From the home page for PWA, in the Quick Launch area, click on Server Settings option. From the Server Settings page, in the Security section, click on the Manage Groups options. From the Manage Groups page, click on the Team Members option. From the Add or Edit Group page, hold down the Shift key, click on the users whom you want to add from the Available Users list, and then click on Add. Under Categories, verify or add My Tasks from Available Categories to Selected Categories. In order to enable status update processing by the synchronization engine for integration with Project Server 2010, you must add the service account for Team Foundation Server to the Project Server Service Application. This can be done alternatively you could use Windows PowerShell (not covered here). Launch the SharePoint Central Administration page for Project Server. Under Application Management, choose the Manage service applications option. 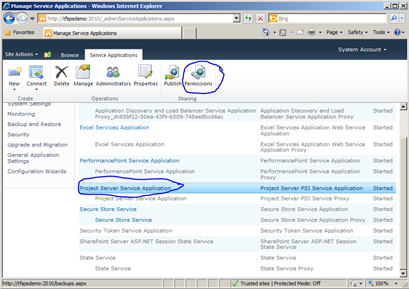 From the Manage Service Applications page, highlight the Project Server Service Application row by clicking within the row but not the name of the application. The ribbon will now be available. In the ribbon, select the Permissions option. In the Connection Permissions for Project Server Service Application dialog box, type the name of the service account, and then select Add. In the middle pane, make sure that the name of the newly added service account is highlighted. In the bottom pane, select the Full Control checkbox, and then select OK.
To enable data synchronization, you need to grant permissions to the service account for the web application pool to update two SQL Server databases for each instance of PWA for Project Server 2010. Log on to the data-tier server for Project Server. Select, SQL Server Management Studio in Start | All Programs| Microsoft SQL Server 2008. The Connect to Server dialog box will now open. In the Server type list, select Database Engine. The SQL Server Management Studio page opens. Expand the Databases option, open the shortcut menu for the database for the instance of PWA (for example, PWA_Reporting), and then select Properties. Under Select a page, select Permissions. Add the service account of the web application pool for Project Server, and grant the required permissions. For example, Alter any Schema, Create Table, Delete, Execute, Insert, Select, and Update are the permissions required for the reporting database. On the Publishing database (PWA_Published), grant the Select permission. Repeat steps 7 through 10 for each instance of PWA that will participate in data synchronization with Team Foundation Server. Although we've covered most of the key parts already, there are a few other things you might want to consider. We'll cover those in the following section. You must grant all service accounts for Project Server and SharePoint products, permission to log on to the computer on which the service is running. The service account for Team Foundation Server also runs the Team Foundation Background Job Agent Service. All TfsAdmin commands are run in this service accounts context, except for the /RegisterPWA and /UnregisterPWA options, which are run under the executing user. The Team Foundation Background Job Agent Service manages data synchronization processes. This service account requires permissions to access each instance of PWA that has been mapped and permissions to call Project Server integration services. We'll cover the initial permission configuration required and the steps to get you through configuring these for Team Foundation Server Extensions for Project Server in this recipe. These are not all the permissions in setting the complete system up, but just the ones required to begin configuration. It is possible that in a large enterprise installation, you will need to separate the requests to get them set by several individuals. This should help with facilitating that. In the previous recipe we installed the integration. Now we'll build off of that as we configure the integration. Please take a moment to review the work we've done previously before we begin. To initially configure the permissions required, you will need to assign administrative permissions of Team Foundation Server and an instance of Project Web App (PWA) to a user who will be responsible for the configuration of these products. You will use the Team Foundation Server Administration Console page for most of the Team Foundation Server permissions, and the Project Security dialog box or Manage Users / Manage Groups web pages for PWA. Please note these are the minimum configurations you'll need to perform for permissions, your installation may need more depending on your specific site requirements. We'll lay the steps out in the following section by subject to make it easy to follow and refer back to later. Firstly, we will be setting initial permissions. Account(s): This is the account(s) that will be used to configure the integration of the Team Foundation Server. If this is the same user who installed Team Foundation Server, then this task would already be done during that product's installation and configuration. Open the Team Foundation Server Administration Console page from the Start menu of the Team Foundation Server. Navigate to the Group Membership dialog (Team Foundation Server Administration Console | Application Tier | Group Membership) to add this account to the Team Foundation Administrators group. This user will be using the command-line tool TFSAdmin, this will be installed by Visual Studio 2012 during its installation. Account(s): These are the accounts of the project managers or other users who will manage the mapping of enterprise projects. 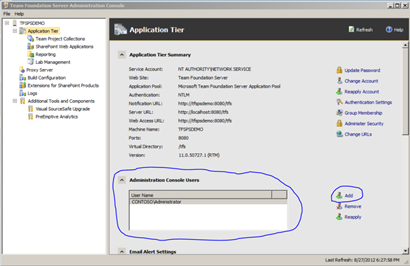 Navigate to Team Foundation Server Administration Console | Team Project Collections | Administer Security dialog box to add the account to set the Administer Project Server permission to allow the user or group. This is a project collection level permission. Account(s): This is the account(s) of user who will configure the integration of Team Foundation Server and Project Server or the one who registers the instances of PWA with Team Foundation Server service account for Team Foundation Server. Open the PWA Site in Internet Explorer at http://tfspsdemo/PWA/default.aspx. Navigate to Project Web App | Edit User | Selected User | Global Permissions Section | Manage Security. 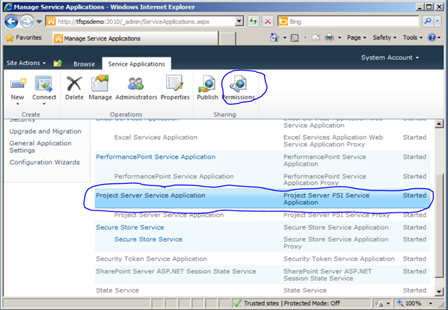 Every service account for Project Server and SharePoint Products must be granted interactive logon permissions for the computer on which the service is running. This is not a usual permission for services so it bears special mentioning. You will need to repeat this on every PWA instance. Account(s): This is the service account for Team Foundation Server. Run the SharePoint Central Administration page from the Start menu. 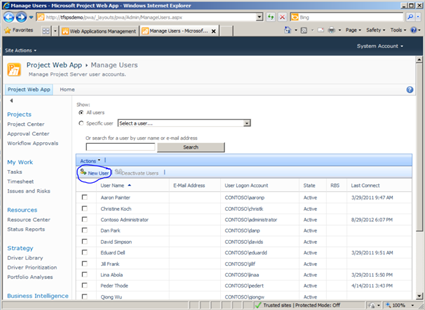 In the Application Management section, click on the Manage Service Applications option (many service applications will be listed here normally). From the Manage Service Applications page, select the row for Project Server Service Application by clicking within the row but not right on the name of the application, that is, don't double click on it. If you do, no big deal, you just need to go back to the previous step and try it again. The ribbon should then become available. In the ribbon you should see a Permissions icon, click on the Permissions icon now. Within the Connection Permissions for Project Server Service Application dialog box, enter the name of the service account you will be using for this service, and then click on Add. You can go back and change this later if you need to. In the middle pane, ensure that the name of the service account that you just added is still highlighted, if not please highlight it now. From the bottom pane, select the Full Control checkbox then click on OK.
Account(s): This is the service account for the web application pool for Project Server 2010 (you can find this by opening Application Pools in IIS Manager | Connections). Since the following commands can take some time, there is also a handy PowerShell script you can use which is at the end of the Summary section. Select SQL Server Management Studio from Start | All Programs | Microsoft SQL Server 2008. SQL Server Management Studio opens. Under the Select a page list, select Permissions. Add the service account of the web application pool for Project Server, and grant the required permissions. For example, the following permissions for the reporting database are required: Alter any Schema, Create Table, Delete, Execute, Insert, Select, and Update. Repeat steps 7 through 9 for each instance of PWA that will participate in data synchronization with Team Foundation Server. Account(s): These are the Team Foundation Server team members who will submit status updates to Project Server from a client of Team Foundation. 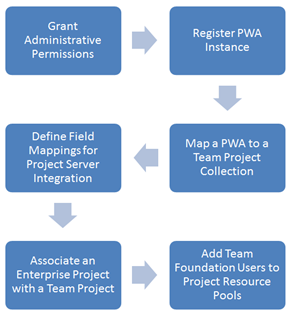 In the PWA SharePoint site, add team members to the Team Members group for the PWA, or you must grant them the following minimum set of project permissions, namely, Open Project and View Project Site. Account(s): These are the users of Project Professional who will publish plans to Team Foundation. Open the Team Foundation Server Administration Console from the Start Menu. In Team Foundation Server Administration Console, Grant View Project-level information permissions in Team Foundation, or assign them as members of the Reader group for the team project. If some of the steps given here are not detailed enough for you, not to worry. We cover many of the same ones in the recipe, Permissions and Security.